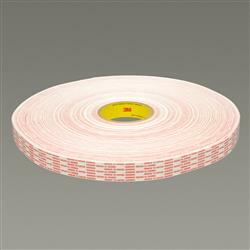 3M(TM) Adhesive Transfer Tape Extended Liner 9926XL is a 1.0 mil, general purpose, extended liner, pressure sensitive acrylic adhesive transfer tape ATT with a densified kraft paper liner. Acrylic Adhesive 400 family. Economical alternative for general paper-to-paper applications. Used for Point of Purchase P.O.P. displays, core starting, mounting novelty items, business forms, posters and general printing. Jaco Aerospace and Industrial is your one stop resource for 3M(TM) Adhesive Transfer Tape Extended Liner 9926XL is a 1.0 mil, general purpose, extended liner, pressure sensitive acrylic adhesive transfer tape ATT with a densified kraft paper liner. Acrylic Adhesive 400 family. and all of your 3M Products, Tapes, aerospace and industrial needs.